What's up, doc? You don't have to be a bunny to know carrots are delicious. Not only is this root vegetable packed with antioxidant-rich beta-carotene, it's also a great source of a number of other nutrients and antioxidants. But when you get sick of eating them steamed, boiled, or julienned, test out an even better alternative: cake! This recipe calls for a whopping two cups of grated carrots, and pairs it with whole-wheat pastry flour and coconut sugar. 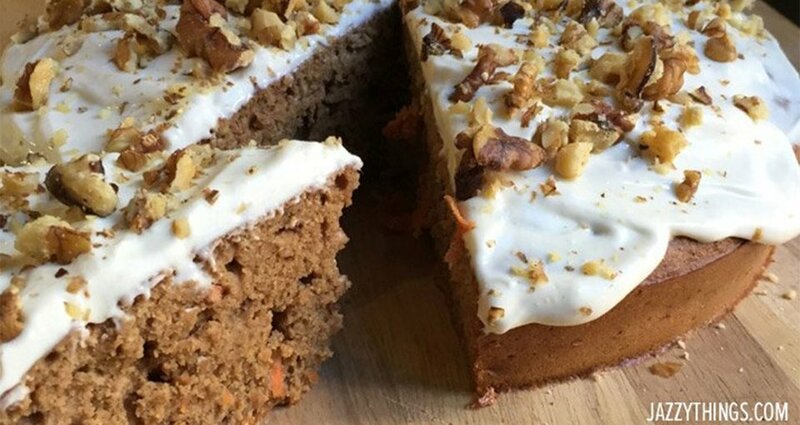 But this is no ordinary carrot cake. The addition of whey and Greek yogurt turn this delicious dish into a protein powerhouse. Bake it, and dig in. Combine all ingredients, excluding carrots. Pour into 9-inch cake pan. Bake at 350 degrees F for approximately 35-40 minutes. Combine the ingredients for the frosting in a food processor or blender. Frost the cooled cake. Top with walnuts.